Tamiflu is chemotherapy that’s now given to babies. How can it be justified when it produces next-to-no benefit, produces and worsens symptoms it supposedly prevents, and even causes brain swelling and death? As David points out, its maker, Roche, hid Tamiflu’s adverse effects. Filter and word balloon added. Prevention? If you were given a $120 dollar bottle of mints and told it would prevent the flu, it would seem to work 90% of the time. This is because, on average, you already have a 90% chance of not getting the flu, give or take. If you still get the flu, you are told you were infected before starting the therapy—but the mints have made your flu milder than it would have been. You may be told a few people will still get the flu during or after eating the mints because mints are not 100% effective, but if you don’t take it you have no protection at all. Treatment? Let’s say you’ve had the flu already for a couple days. The CDC says to hurry in as soon as flu-like symptoms appear. The doctor gives you the mints and says you will eventually feel better and the flu will go away. Sure enough, you recover. You will start to feel better the next day or two—as would with folks who just stayed home, rested, and drank plenty of water. But Tamiflu pills are not mints, they are a drug—and all drugs have adverse effects. However, it does appear you would be better off taking mints rather than Tamiflu. What are the Adverse Reactions of Tamiflu? The Tami in Tamiflu is of Japanese origin, and the meaning of Tami is “let people see benefit”. So, let’s look at the benefits of ethyl (3R,4R,5S)-5-amino-4-acetamido-3-(pentan-3-yloxy)-cyclohex-1-ene-1-carboxylate. 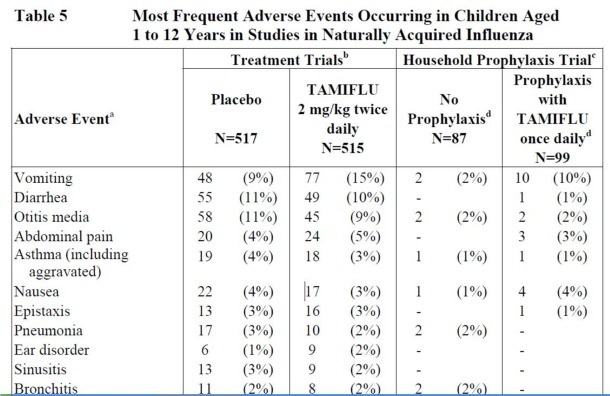 The extract of the Roche report below shows 1 to 12 year olds being treated for flu with Tamiflu have about the same symptoms as those taking a placebo (sugar pill)—except that compared to kids taking nothing, 70% more of the kids taking Tamiflu were vomiting. (An increase from 9% to 15% is a 70% increase–not 6%.) Five times more children taking Tamiflu for flu prevention had vomiting and four times more kids had nausea than those who took nothing. 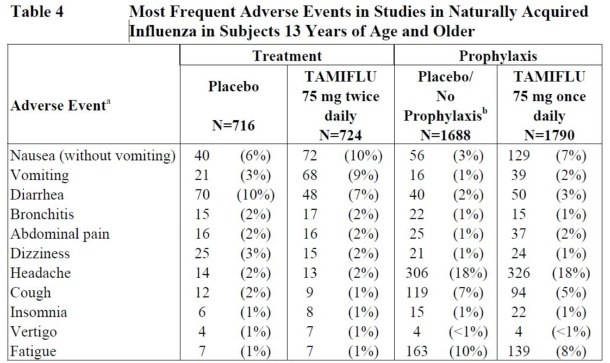 In other words,Tamiflu makes kids sicker. Even so, the CDC recommends that infants as young as two weeks receive Tamiflu. They are also clear that Tamiflu is not a substitute for flu vaccines and that flu vaccinations should be taken also. What about the adverse reactions for teenagers and adults? According to their own clinical trial, the group being treated for flu has nearly 2 times the nausea, 3 times the vomiting and about the same other flu symptoms as those taking nothing (except for a little less diarrhea). Those taking Tamiflu for 5 weeks, as recommended for flu prevention, had 2 times more nausea, 2 times more had vomiting, 2times more had stomach pains, and 50% more had diarrhea than those taking nothing. In other words, Tamiflu made them sicker. The Roche report states no studies have been conducted on the safety of Tamiflu for pregnant women or fetuses and that it is not to be taken—unless the doctor decides the benefits outweigh the risks. Yet the CDC says that pregnant women should rush out and take it at the first signs of flu. The CDC explains that onset of mental conditions, brain swelling, and death may occur after taking Tamiflu, but assures us that the cause has not been established. We are further assured that most of these cases have only been seen in Japan. How effective is Tamiflu in preventing or treating the flu? In 2009, the BMJ and researchers at the Nordic Cochrane Centre asked Roche to make all its Tamiflu data available. At the time, Cochrane Centre scientists were commissioned by Britain to evaluate flu drugs. They found no proof that Tamiflu reduced the number of complications in people with influenza. As of January 2013 the data has not been released to them. Roche is also being investigated by the European Medicines Agency for not properly reporting side effects, including possible deaths, for 19 drugs including Tamiflu that were used in about 80,000 patients in the U.S.
Journal of Natural Food and Health. Here are two brief videos. One is a BBC headline news broadcast from 2009 when this deception was uncovered and the other was produced by a doctor and a nurse last month. This page contains a single entry by sal published on February 5, 2013 5:16 PM. Aspartame Linked to Leukemia and Lymphoma in Landmark Study on Humans was the previous entry in this blog. The Shocking Story of How Aspartame Became Legal is the next entry in this blog.